“Takoma Park is more than 100 miles away from the Atlantic Ocean, but a 17-foot-long octopus somehow found its way here and wrapped its giant tentacles around the downtown clock tower. 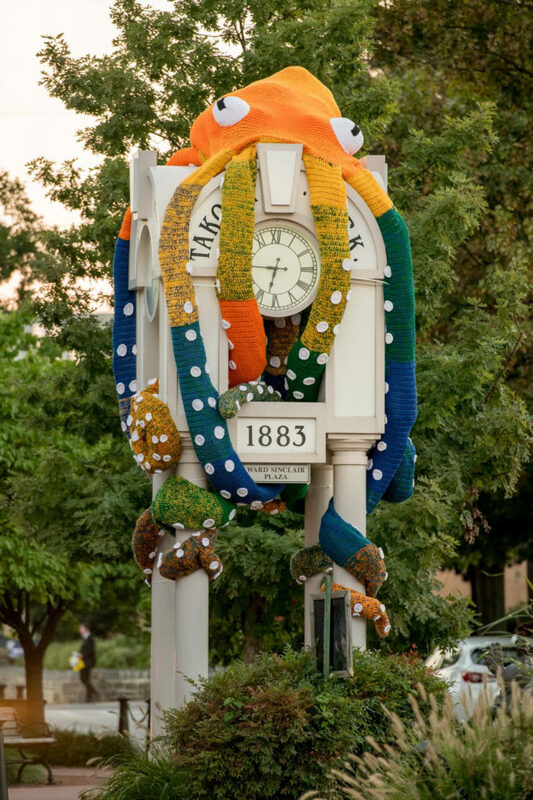 In a public art project commissioned by the City of Takoma Park, fiber artist Stacy Cantrell crocheted the huge octopus in the City’s colors of orange, yellow, green, and blue. With help from her husband and a friend, she installed the creature recently on the clock tower in Ward Sinclair Plaza at the intersection of Laurel Avenue and Carroll Avenue. Then she watched the smiles and dropped jaws from surprised people walking by. 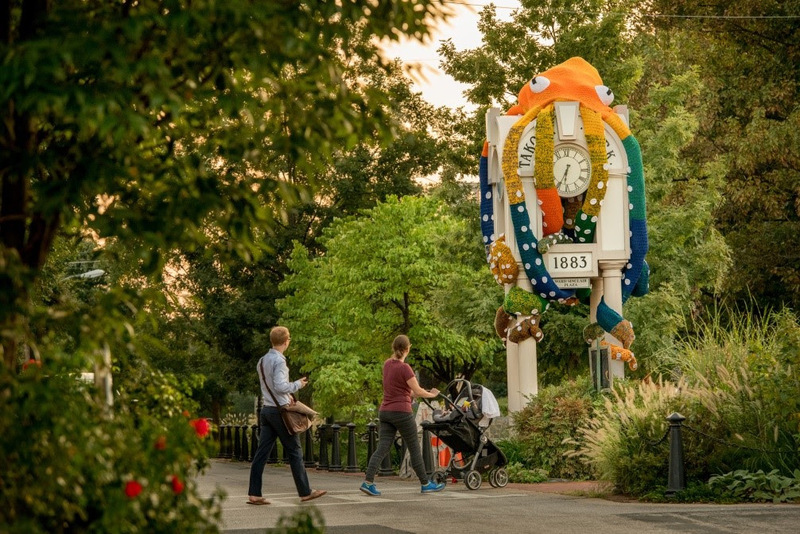 The installation titled Oct O’Clock will be on view for several months before the colorful cephalopod is donated to a local school or children’s organization. Cantrell used more than 120 pounds of yarn to create the deep-sea beast with some intricate details, including 360 crocheted suckers on its tentacles. The octopus is stuffed with more than 100 pounds of recycled plastic, including bags, water bottles, etc. 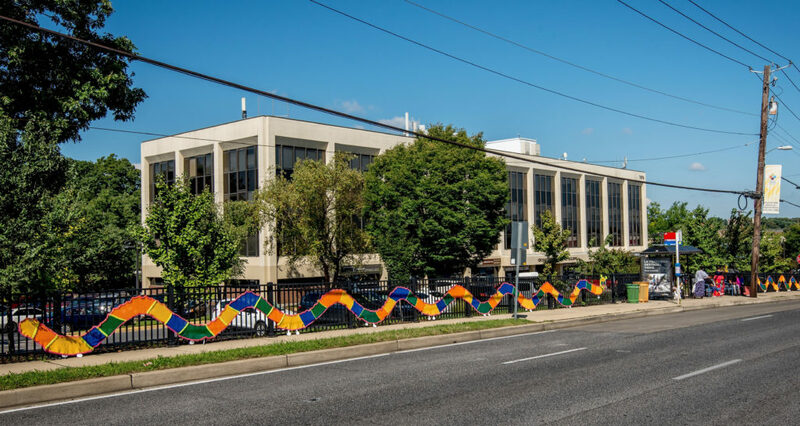 The City of Takoma Park also commissioned Cantrell to install two giant crocheted caterpillars in the City’s colors on a fence at 7676 New Hampshire Avenue south of University Boulevard. One 80-foot-long caterpillar and its 65-foot long friend are climbing down a hill past a bus stop in the installation titled Scoochin’ Down the Avenue, Two by Two! After that installation is removed in a few months, Cantrell will wash and disassemble the pieces to make baby blankets that will be donated to local organizations serving families in need. “I love bringing these creatures to life, but I also want to reuse these materials to help others,” she says. The City of Takoma Park commissioned the fiber installations as part of its commitment to support and promote the arts, including public art that can inspire or surprise people in their daily lives without visiting a museum or art gallery. “Stacy’s work is so delightful. It really exceeded all of our expectations,” says Sara Anne Daines, director of the City’s Housing and Community Development Department. Cantrell learned how to crochet when she was 4 years old and has displayed her work at the Smithsonian Museum of Natural History, Arlington Arts Center, Torpedo Factory, and other locales.